Sonny Cheeba | Digging in tha crates. Every once in a while a piece of music enters ones conscience that makes you wonder how you got by without it all those years. Camp Lo’s Coolie High has been one of those songs for yours truly. I remember when I first heard the song at a house party some five, six years ago and unfortunately I was too far off the map and preoccupied to walk up to the desktop to find out just what exactly it was that was playing. The smooth-as-butter instrumentals and nimble flows did however leave a mark and when one of my friends casually put it on at another house party years later I immediately recognised it, had a eureka moment of sorts and managed not to forsake finding out what was that time. Coolie High has since been a favourite track of mines, kept in heavy rotation and helping me zone out for a bit at those times when life gets a little too stressful. Their other hit song Luchini AKA This Is It also turned out to be a classic and sounds like Coolie High‘s polar opposite production-wise. The beat has a cinematic horn loop among other things that doesn’t creep up your spine but grabs you by the throat in stead. Neither song has any particularly meaningful lyrics but everything the Lo say does sound cool with a poetic veneer, and their liquid flows are near perfect which puts the guys somewhere between being instruments used by Ski to complete his music and star MCs in their own right. The duo behind these songs hails from the Bronx, New York and entered existence in 1995. Soon they hooked up with producer DJ Ski and started working on their debut album Uptown Saturday Night, the subject of today’s post, released on Profile Records, home of RUN-DMC. Unfortunately for them during the recording a young upstart who went by the name of Jay-Z came along and stole purchased the instrumental, the hook and the flow of their songs Feelin’ It (and who knows what else) wholesale from their producer Ski for his debut album Reasonable Doubt. Despite that minor setback they continued to work on their album and it dropped in early ’97. Despite not conforming to any of the dominant sounds in hip-hop of the time, those being P. Daddy’s shiny disco rap, Dr. Dre’s syrupy G-funk sound or RZA’s dusty beats, they managed to score two minor hits off their debut, the previously mentioned Coolie High and Luchini AKA This Is It. These songs introduced the world to the Lo’s confidently delivered ’70s blaxploitation slang raps and Ski’s atmospheric, soulful and jazzy yet down to earth productions. That would unfortunately be the entirety of their commercial success as nothing they did following that charted, but that didn’t stop them from staying together, collaborating with their boy Ski and putting out albums for the decade following this album’s release so they probably have a small but dedicated cult following or so it would seem. 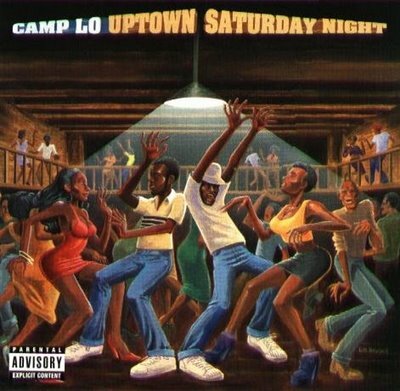 Nothing on Uptown Saturday Night surpasses or even matches the artistic success of the positively epic Luchini or aural relaxant Coolie Hight, but the rest of the album is still quite entertaining. Highlights include the Jamiroquai-esque piano groove of Sparkle and the smacking salsa-hop of Rockin’ It. The booming opener Krystal Karrington is also pretty awesome. The rest of the songs are fairly entertaining filler and Uptown Saturday Night as a whole is an underrated gem of an album that is deserving of every hip-hop head’s time and attention.